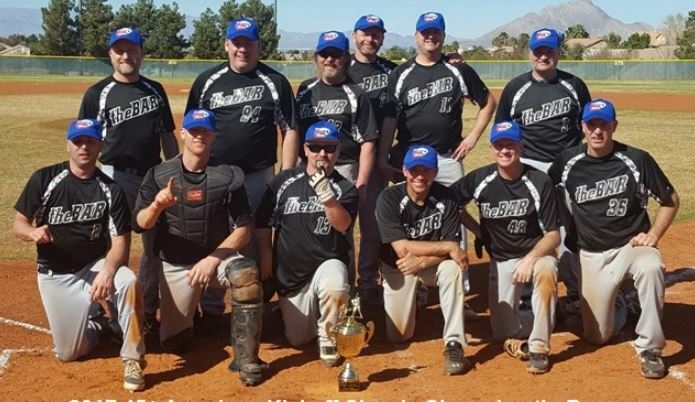 In their first appearance, theBAR won the MSBL Las Vegas Kickoff Classic 45+ American Division Championship with a 10-1 victory over the Las Vegas Rattlers. theBAR struck first with a 2-RBI single from Mark Baker in the first inning, followed by RBI singles by Scott Schlag in the second inning and Mike Burton in the third. theBAR scored twice in the fifth, then racked up four more runs in the ninth inning. Baker finished the game with five rbi’s. David Winstead pitched a complete game, striking out three and allowing only one earned run. In total, Winstead pitched 18 innings for the day, after pitching a complete game in the semi-finals earlier in the day. For the tournament theBAR batted .433, scoring 73 runs with 97 hits, while the pitching finished the six games with a 2.11 ERA. It was a total team effort both on and off the field.